The world knows Aimee Leduc, heroine of 15 mysteries in this New York Times bestselling series, as a tres chic, no-nonsense private investigator-the toughest and most relentless in Paris. Now author Cara Black dips back in time to reveal how Aimee first became a detective . . . November 1989: Aimee Leduc is in her first year of college at Paris's preeminent medical school. She lives in a 17th-century apartment that overlooks the Seine with her father, who runs the family detective agency. But the week the Berlin Wall crumbles, so does Aimee's life as she knows it. First, someone has sabotaged her lab work, putting her at risk of failing out of the program. Then, she finds out her aristo boyfriend is planning to get engaged to another woman. And finally, Aimee's father takes off to Berlin on a mysterious errand. He asks Aimee to help out at the detective agency while he's gone-as if she doesn't already have enough to do. 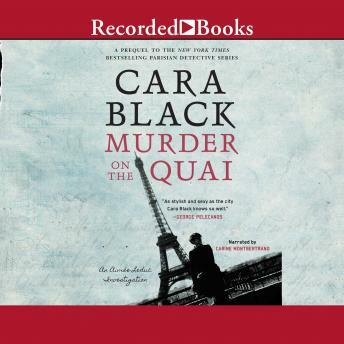 But the case Aimee finds herself investigating-a murder linked to a transport truck of Nazi gold that disappeared in the French countryside during the height of World War II-has gotten under her skin. Her heart may not lie in medicine after all-maybe it's time to think harder about the family business.